A meteor streaked through the sky and exploded Friday over Russia's Ural Mountains with the power of an atomic bomb, its sonic blasts shattering countless windows and injuring more than 750 people. The spectacle deeply frightened thousands, with some elderly women declaring the world was coming to an end. The meteor -- estimated to be about 10 tons -- entered the Earth's atmosphere at a hypersonic speed of at least 33,000 mph and shattered about 18-32 miles above the ground, the Russian Academy of Sciences said in a statement. It released the energy of several kilotons above the Chelyabinsk region, the academy said. Amateur video broadcast on Russian television showed an object speeding across the sky about 9:20 a.m. local time, just after sunrise, leaving a thick white contrail and an intense flash. "There was panic. People had no idea what was happening. Everyone was going around to people's houses to check if they were OK," said Sergey Hametov, a resident of Chelyabinsk, a city of 1 million about 930 miles east of Moscow. "We saw a big burst of light, then went outside to see what it was and we heard a really loud thundering sound," he told The Associated Press by telephone. The explosions broke more than 1 million square feet of glass, city officials said. The city administration said 758 people sought medical care after the explosions and most were injured by shards of glass. Athletes at a city sports arena were among those cut up by the flying glass. SKY FALL: WHEN DO METEORITES STRIKE? A meteor exploded in the sky above Russia on Friday, causing a shockwave that blew out windows injuring hundreds of people and sending fragments falling to the ground in the Ural Mountains. What's the difference between a meteor and a meteorite? Meteors are pieces of space rock, usually from larger comets or asteroids, which enter the Earth's atmosphere. Many are burned up by the heat of the atmosphere, but those that survive and strike the Earth are called meteorites. How fast do meteorites go? The soaring bits of space rock often hit the ground at tremendous speed -- up to 18,642 mph, according to the European Space Agency. That releases a huge amount of force. How common are meteorite strikes? Experts say smaller strikes happen five to 10 times a year. Large impacts such as the one Friday in Russia are rarer but still occur about every five years, according to Addi Bischoff, a mineralogist at the University of Muenster in Germany. Most of these strikes happen in uninhabited areas where they don't cause injuries to humans. It was not immediately clear if any people were struck by space fragments. Another Chelyabinsk resident, Valya Kazakov, said some elderly women in his neighborhood started crying out that the world was ending. City officials said 3,000 buildings in the city were damaged by the shock wave, including a zinc factory where part of the roof collapsed. Small pieces of space debris -- usually parts of comets or asteroids -- that are on a collision course with the Earth are called meteoroids. They become meteors when they enter the Earth's atmosphere. Most meteors burn up in the atmosphere, but if they survive the frictional heating and strike the surface of the Earth they are called meteorites. Meteors typically cause sizeable sonic booms when they enter the atmosphere because they are traveling much faster than the speed of sound. Injuries on the scale reported Friday, however, are extraordinarily rare. The meteor hit less than a day before the asteroid 2012 DA14 is to make the closest recorded pass of an asteroid to the Earth -- about 17,150 miles. But the European Space Agency in a tweet said its experts had determined there was no connection. Some fragments fell in a reservoir outside the town of Cherbakul, the regional governor's office said, according to the ITAR-Tass. A 20-foot-wide crater was found in the same area, which could come from space fragments striking the ground, the news agency cited military spokesman Yaroslavl Roshchupkin as saying. Reports conflicted on what exactly happened in the clear skies. A spokeswoman for the Emergency Ministry, Irina Rossius, told the AP there was a meteor shower, but another ministry spokeswoman, Elena Smirnikh, was quoted by the Interfax news agency as saying it was a single meteor. Donald Yeomans, manager of the U.S. Near Earth Object Program in California, said he thought it was probably "an exploding fireball event." "If the reports of ground damage can be verified, it might suggest an object whose original size was several meters in extent before entering the atmosphere, fragmenting and exploding due to the unequal pressure on the leading side vs. the trailing side (it pancaked and exploded)," Yeoman said in an email. "It is far too early to provide estimates of the energy released or provide a reliable estimate of the original size," Yeomans added. The site of Friday's spectacular show is about 3,000 miles west of Tunguska, which 1908 was the site of the largest recorded explosion of a space object plunging to Earth. That blast, attributed to a comet or asteroid fragment, is generally estimated to have been about 10 megatons; it leveled some 80 million trees. The dramatic events prompted an array of reactions from prominent Russians. Prime Minister Dmitry Medvedev, speaking at an economic forum in the Siberian city of Krasnoyarsk, said the meteor could be a symbol for the forum, showing that "not only the economy is vulnerable, but the whole planet." 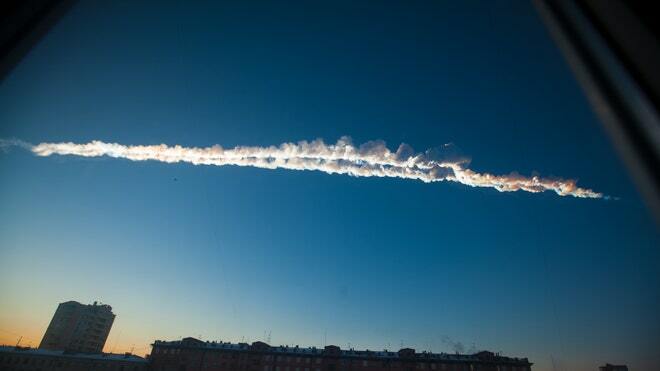 Vladimir Zhirinovsky, a nationalist leader noted for vehement statements, said "It's not meteors falling. It's the test of a new weapon by the Americans," the RIA Novosti news agency reported. Deputy Prime Minister Dmitry Rogozin said the incident showed the need for leading world powers to develop a system to intercept objects falling from space. "At the moment, neither we nor the Americans have such technologies" to shoot down meteors or asteroids, he said, according to the Interfax news agency.